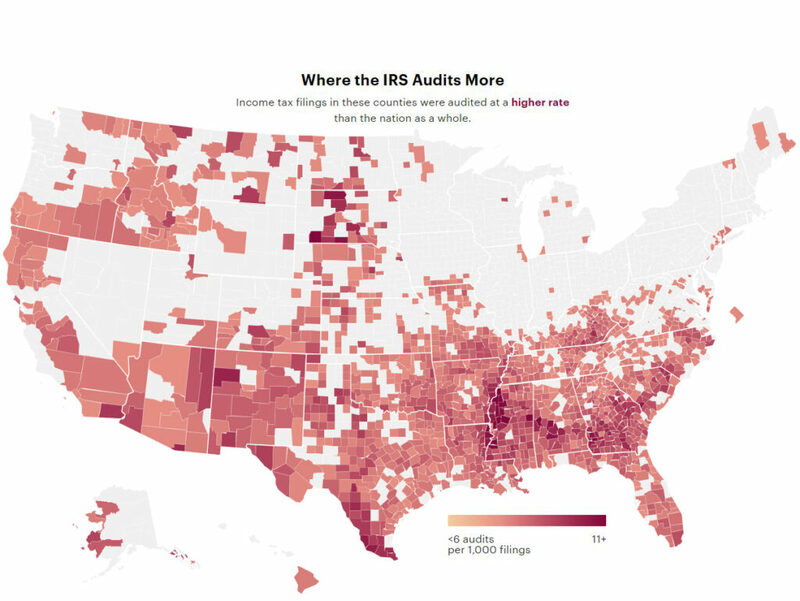 A map by Kim M. Bloomquist of Tax Notes showing the counties with the highest IRS audit rates across the nation. The revelation that residents of Maine’s two poorest counties are more likely to be audited than wealthier Americans has U.S. Sen. Angus King calling on the Internal Revenue Service to change its ways. In the wake of recent ProPublica investigations into the frequency of IRS tax audits, the Maine independent said federal tax overseers need to adopt a more-just method of selecting whose returns should be audited. Data compiled by Tax Notes found Piscataquis and Washington counties are treated especially unfairly because they rely more heavily on the anti-poverty Earned Income Tax Credit. Estimated data from Maine published by Tax Notes shows a similar bias towards more audits for poorer counties within Maine. Taxpayers in relatively well-off York County, for instance, face audits at a rate of 6.8 per 1,000 residents, the lowest rate in the state, while those in struggling Washington County in northeastern Maine are audited at a rate of 7.9 per 1,000 residents. Put another way, it means someone filing taxes in Washington County is 16 percent more likely to face an audit than someone in York County. Androscoggin, Franklin and Oxford counties fall in the middle of the pack for Maine audit rates. ProPublic found recipients who claim the credit on their tax returns are audited at twice the rate of Americans earning between $200,000 and $500,000 annually, a consequence of the IRS scaling back on larger, time-consuming audits following budget cuts during the past eight years. For example, it said, last year IRS audits of Earned-Income Tax Credits amounted to 36 percent of all of its reviews of tax filings. In 2011, before budget cuts made a dramatic impact on the IRS, EITC audits made up 33 percent of the total, an ongoing shift that has poorer people facing a greater risk of an audit than nearly all other Americans. The only group with a greater chance of facing an audit than the poor, ProPublica reported, are those earning more than $1 million annually. Households that earned between $50,000 and $100,000 are least likely to be audited, ProPublic said. “I urge you to refocus the IRS’s all-too-scarce resources on auditing people with known rates of high tax noncompliance, and away from the people, including many in my state, who are most harmed by the audit process,” the second-term lawmaker said. King said the greater focus on auditing EITC filers is counterproductive. He said that according to the National Taxpayer Advocate, overpayments of the credits account for 6 percent of overall noncompliance by taxpayers. “By contrast, individuals who underreport business income are responsible for 51.9 percent of such noncompliance,” King said. Tax Notes said the IRS and policymakers could change things by increasing the IRS enforcement budget “to enable more audits of high-income taxpayers,” who generally consume more resources because their returns are more apt to be complex. Lacking that, though, it said the IRS could take steps to make sure it audits returns from each state at about the same rate, which would help alleviate the bias toward auditing lower-income Americans. The lowest audit rates, on the other hand, “tend to be home to middle-income, largely white populations: places like New Hampshire, Wisconsin and Minnesota,” ProPublica found. New England is generally among the least likely areas for audits. King said in his letter to the IRS that “when a taxpayer comes under audit,” the IRS may hold back refunds until the audit is complete. ProPublica reported audits often take more than six months before agents even look at the returns because of a staffing shortage.